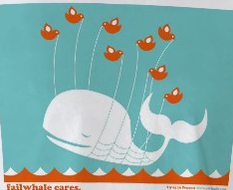 Twitter’s Fail Whale has been making quite the appearance lately. A picture of the whale appears on Twitter pages when the site is “over capacity,” which seems to happens more often than it used to. My guess is that this is because so many people are joining Twitter. Throughout the past month, I’ve received an increased amount of e-mails letting me know that people are “following” my updates on Twitter. Last year at this time, I never thought I’d be a Twitterer who Twittered Tweets. I said as much in a two-part series of articles I wrote about news organizations experimenting with Twitter. At the time, people were just starting to use this social networking site. “What’s Twitter?” lots of people would ask. “You answer the question ‘What are you doing?’ Doesn’t that sound a little pretentious?” Now I get asked these questions much less frequently. Sure, the idea of updating everyone on what you’re doing can seem pretentious, but many Twitterers don’t answer this question literally. They mix up their Tweets with questions that they pose to their followers, or quotes they like, or links to their recent blog posts. More than anything, I use Twitter as a news aggregator. I am “following” about 50 news organizations on Twitter, meaning any time the news organization updates its Twitter page, I receive a Tweet alerting me to the news. Rather than visiting Newyorktimes.com, espn.com, npr.org and cnn.com individually, I can use Twitter as my one-stop news shop. I’ve shared this use of Twitter with some of my journalism friends, and a few have since joined. I wonder what has caused so many people to join Twitter recently, and if the Fail Whale will keep appearing on my Twitter page when I try to update it. If you’re a new Twitterer, what made you want to join? If you’re not a Twitterer, why haven’t you joined yet?